Perry displays one of his cleverest tricks when he passes a magnet over an incriminating tape recording and erases it. It�s too bad that his client, Harriet Bain, has to go and get herself arrested for murder anyway, after all that trouble. CARS. 1957 Citro�n DS19 4-Door sedan, light w/ dark top. From The Cars by Greg Cockerill. Sightings: Distinguished Gentleman #1 plays the court reporter again. Submitted by Kenmore, 10/3/10. The Pencil Mustache Man does double duty in this episode. He appears firstly as a court officer (standing and then sitting by the window�well, it�s been a long day) and later as a bystander at the lockers behind Addison Doyle. He may even be speaking with Distinguished Gentleman #1. Submitted by evelyne, 18 February 2011. Sasha Magaloff appears in court on Perry's side wearing glasses, Submitted by BigBill767, Nov 11, 2016. The uncredited detective who discovers the ice pick appears to be Jeffrey Sayre, a bit player and background extra in many TV and film projects of the time. Sayre has three uncredited Perry Mason listings in IMDb, TCOT Shoplifter's Shoe (department store customer), TCOT Weary Watchdog (party guest), and TCOT Clumsy Clown (courtroom spectator). Here he has dialogue and appears in two scenes (he also helps unload the deep freezer), but is not credited nor listed in IMDb. Submitted by alan_sings, 8/4/2012. Robin Hughes would later play the devil himself (and the title character) on The Twilight Zone episode "The Howling Man" (1960). Submitted by Wiseguy70005, 7/14/12. Possible Goof: When Burger calls Ned Bain to the stand the judge asks "Is there a physician in attendance?" The judge's voice seems muffled as if he doesn't have a microphone and his voice is only picked up from William Talman's microphone. Submitted by Wiseguy70005, 7/14/12. ++ Sorry I wasn't clear, but that's what I meant, that the boom microphone wasn't on the judge. I know they didn't wear mikes and certainly didn't think the judge's desk mike was operational. Submitted by Wiseguy70005, 8/05/12. Another possible goof: At 2057 on the DVD Harriet Bain's car (and license plate) are seen in a taxi driver's rearview mirror. However, the image is not reversed as it should be. Submitted by D. Tlougan 5/1/15. Syndicated cuts: Mason and Harriet go to the Bain house and are met by Sylvia and Mason's introduction to Addison; Addison tells Mason about being charming and Mason warns him not to become involved with Sylvia; Mason asks Paul about Dr. Gross's Criminal Investigations and Paul says he sent for a copy; Burger's examination of Tragg on the stand; the taxi driver Miller's testimony. +Additional Hallmark cuts: Part of Della and Harriet's conversation concerning Addison's attraction to Sylvia and her description of Sylvia being everything Harriet wasn't; a brief section of West trying to play the tape after Mason has erased it; Mason's first objection during West's testimony concerning best evidence and Burger's reply that he will introduce the tape after laying proper foundation. Submitted by Wiseguy70005, 7/14/12. Christian Nyby, the director of this episode, is famous for directing the 1954 Howard Hawks production of the science-fiction classic "The Thing." Submitted by Rev. Susie the Floozie, 10/18/12. It's for you, Mr. Mason: A good secretary always knows where the boss is. This time Della reaches him at the Bain residence. Submitted by francis, 6/05/14. Sponsored Items: I watched this episode on MeTV and was surprised to see the pictures of FOUR sponsored items show up during the closing credits (like in episode 7 and 240). The same FOUR items pictured at the end in episode 7 show up here. As I stated in episode 7, I could not figure out the First one shown, but Wiseguy70005 stated on 4/14/15 that the first one is actually "Sweetheart Soap" (I NEVER would have guessed that one, so thanks for the info! To me, the first letter looked like a "G" as in the word "Gourmet" and the product looked like a "bun"!). The Second was "New Blue Dutch Cleanser". The Third was "trend" (with a lower case "T"). The Fourth was "Beads-O'-Bleach". Submitted by mesave31, 04/19/15. The $50,000 that Arthur West demands as blackmail would be about $367,517.30 today. The $25,000 would be $183,758.65. Submitted by billp, 1/1/2009. When Burger has poor old Ned Bain hauled into Court, he tells him he can answer with impunity about the alleged theft (statute of limitations [SoL] having expired). I think that�s only a half-truth (and a little typical of Burger). If the SoL has expired, there still would be the possibility of a civil suit by the Bank for the monies stolen and the profits derived thereof. As always, I could be wrong. Submitted by billp, 1/1/2009. + Perry actually concurs with you in the final scene. Submitted by gracenote, 8/29/2011. ++ LOL, as when they wheel him in, they sure do not seem to be very gentle as he looks like he is bouncing all over the place (I saw two bounces)! Leaving, they seem to be going slower. ;-> Submitted by mesave31, 04/19/15. This show marks one of the few times a foreign car, a Citroen, was featured in an episode. The use seems to have been tied to a desire to link Harriet Banes to the murder scene (although IIRC she wasn�t actually driving it). Submitted by billp, 1/1/2009. As an electronic engineer with a certain amount of experience erasing tapes with magnets, I would have to say that I don't think Perry's technique would have done the job. At best, there would have been a slight decrease in volume. Opined by daveb, 3/2/2011. Quite true. Any magnet powerful enough to degauss that tape into silence from the distance Perry held it, would have attracted that tape toward it and then the trick would be obvious ... my father was a music/audio buff,and I have seen that done with audio tape and magnets, with a really powerful neodymium magnet. Submitted by MikeReese, 8/12/2016. This episode opens with stock footage of the Hotel Royal and Victory Clothing. This series would re-use the same footage ten months later, in #42, Pint-Sized Client. (See my comment there on 12/03/2011, before I knew that I have a doppelg�nger.) Submitted by (lowercase, with a comma and period) masonite, 07/21/13. In the novel Ned Bain was innocent of the crime for which he was being blackmailed; J.J. [Stanley] was guilty of the bank robbery. 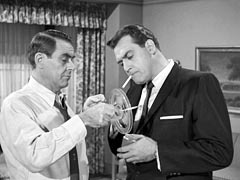 In the episode, he apparently was J.J.'s partner in crime which seems to make whether the tape recording was fake or not less important. Submitted by Wiseguy70005, 1/1/14. + The guilty party in the episode is only a red herring in ESG's original novel. The guilty party in the novel doesn't even appear in the episode. Submitted by BobH, 25 January 2016. I love that dress Della poured herself into. How did she breathe? Submitted by DellaFan, 4/3/14. The ascot says it all. When the script called for a character who was artistic, aristocratic, frivolous or in Show Biz, the producers always knew the best way to dress him: with an ascot. In this episode, two-timing Addison Doyle wears the tell-tale tie. Submitted by francis, 6/05/14. At about the halfway point, when they find the dead body in West's kitchen, you can see the dead guy's index finger twitch on the close up. Eric C. 7 August 16.